Lesson V-9: Captain's Logs If I had a piece of gold-pressed latinum for every dweeb pilot who kept his logs in Stardates, I'd… well, I'd have nothing, because that doesn't exist, dweeb! The following flight log entries are all the information we have regarding the crash of a missing aircraft. According to the captain's log, the aircraft's last reported position (which is where this log information begins) was somewhere within 66.6 nautical miles of your location. Reconstruct the aircraft's path, navigation aid-to-navigation aid, from the log entries, and find where it went down. We know the plane crashed into a municipality with a 2000 Census population under 50,000, but where is unknown. When you know, report the location of the crash, in the format of CITY, STATE POSTAL ABBREVIATION (such as "Chicago, IL"). Of course, you can't reconstruct the route if you can't fly a plane. This handy little primer on the switches and readouts in front of you might help. Chronometer: The time of day. HSI (Horizontal Situation Indicator): The lower-left instrument in the main flight display, showing the aircraft on a compass. Used to display information from the VOR receivers and the ADF, as described below. Radio Stack: The right-hand display, showing six green boxes containing the radio frequencies for the aircraft's various radios. The radios that are active are indicated below the frequency readouts. Communication radios (COM1 and COM2) and transponder are not useful pieces of data here, even though frequencies are shown. VOR1 (NAV1): Stands for VHF Omni-directional Radio Range. Direction of and lateral deviation from selected radial (of tuned-in VOR) indicated by broken green arrow on the HSI. Distance information given in green, below the HSI compass readout. Frequency readout (in the radio stack on the right-hand side of the panel) blank when not in use. VOR2 (NAV2): Direction "to" indicated by blue pointer on the HSI (the side with the circle points "to" the tuned-in VOR). Always tuned to the same station as VOR1. Frequency readout (in the radio stack on the right-hand side of the panel) blank when not in use. ADF: Stands for Automatic Direction Finder. Shows the direction "to" the tuned-in Non-Directional Beacon (NDB). Direction "to" indicated by white "boxed arrow" on the HSI, when present. Bearing "to" given in white, below the HSI compass readout. Frequency readout (in the radio stack on the right-hand side of the panel) blank when not in use. Autopilot: Can be set to follow a given magnetic heading (HDG), or a given VOR radial (NAV), depending on which mode is selected. 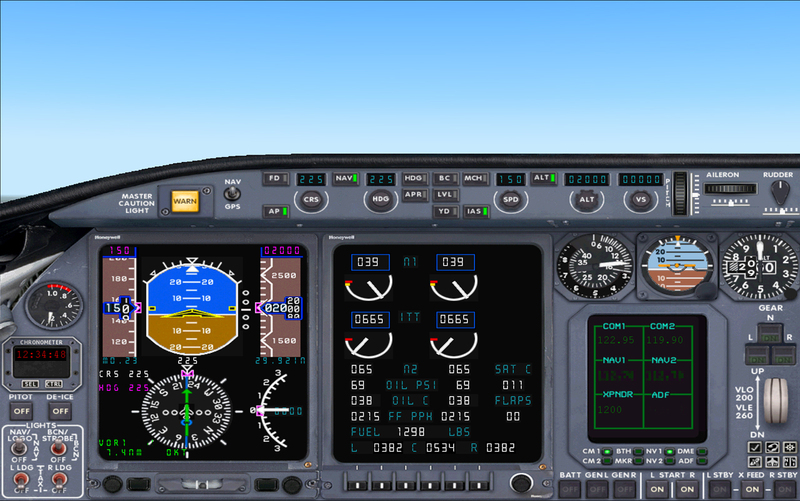 Course Set mode, or CRS mode, can only use information provided to the autopilot by the active NAV radio (i.e., CRS mode can't track the ADF). 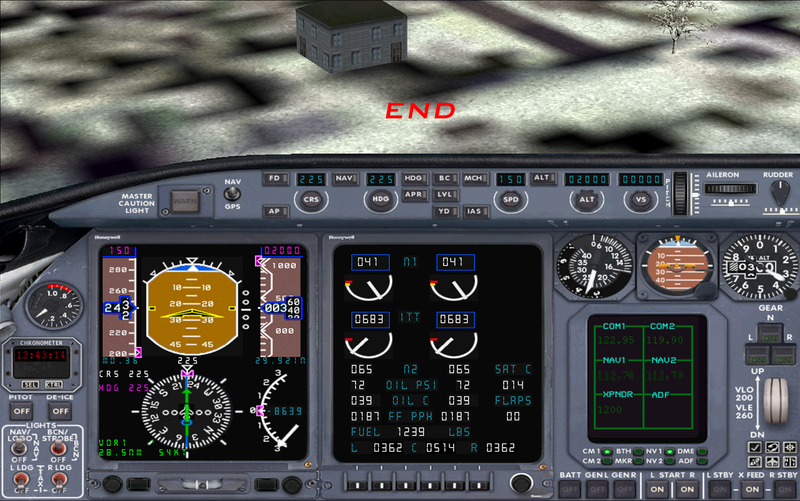 NAV mode course set by the "CRS" knob, and HDG mode heading set by the HDG knob. Altitude (ALT) and airspeed (IAS) information on the autopilot are not useful pieces of data here.